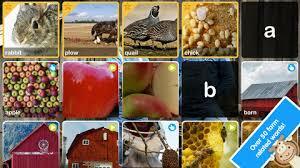 ABC Farm is one of the latest apps in the ABC series that explores words associated with the farm. Various animals, foods, and other farm items are listed with interactive activities and pictures for children to discover and learn. Like many of the ABC series apps, this app is highly educational and interactive with videos, pictures, and the option to view words in English or Spanish. The ABC series apps are always of very high quality with lovely pictures, videos, and bright colors to engage children as they learn. The photographs are wonderful and clearly illustrate the word that is being described. The music and sound effects also compliment the pictures and videos very well. The user interface for ABC Farm is similar to other ABC apps as it provides a list of the terms in alphabetical order that simply need to be tapped to view. Once the word is tapped, users are taken to the picture of the word and have the option of viewing the definition or completing the activity. Children familiar with the other ABC apps will know what to expect and those that have not will have no problem making their way through this app because it is so easy to use. The primary function of ABC Farm is to educate children on various animals, foods, and items that can be found on the farm. They are able to not only see various pictures and videos of the items, but they also are able to listen to the narrator read the definition of each word. Children that are more visual learners are able to view the picture of each item, while auditory learners can listen to the definition in combination with the pictures. Another educational opportunity comes with learning to spell each word. Once the word is selected it appears at the bottom of the picture and children can work on reading and spelling the various words as they move through the app. Children that may be learning English or Spanish as a second language can also use the app in the two languages for an added educational opportunity. Though this app is primarily an educational app, there are interactive components for each world that are meant to add fun to this learning environment. These interactive components guide children to swipe their fingers back and forth over the screen to reveal a new picture or in some cases view a video. It would be nice to have an additional activity or game to enhance the entertainment value of this app to help keep children engaged. While ABC Farm is great for teaching children about various farm animals and items, the lack of entertaining components makes the price seem a little high. There is no doubt there are plenty of educational opportunities, but I don’t know that children will be engaged in this app for long periods of time to learn all the different words etc. and some parents may feel it is a little overpriced. Peapod Labs always does a nice job of making apps that are easy to use for young children. The user interface is fairly intuitive and with the tap or swipe of a finger, children can easily maneuver between screens. There is a button to access other ABC apps within the app, however it is set up in such a way that in order to gain access you have to swipe the screen in a specific way. This is a great way to safeguard against unwanted purchases especially for younger users. The options button is operated the same way and allows access to additional apps, as well as access to email the developers. With no social media links and the added security for the options and in app purchases, this app is great for children, especially little ones.